The last book in my World War II binge is Rose Under Fire. I couldn’t wait to jump in after finishing Code Name Verity. I knew as a companion novel, it wouldn’t be a true sequel, but I was excited to see the next part. The ending of Code Name Verity ripped my heart to shreds, but it warmed to see Maddie coping relatively well several months later. Though Maddie returns in Rose Under Fire, our leading lady of the story is American pilot, Rose Justice. Rose and Maddie do become fast friends though! Elizabeth Wein does a fantastic job again, creating such genuine feeling characters. Rose is a young woman determined to prove female pilots are just as good and just as important to the war effort as male pilots. Though the US is involved with World War II and has been since the bombing of Pearl Harbor, Rose is surprised to find just how different life is in the US vs Europe. The depression is raging in the US as well as in Europe and there are vast shortages, but in the US, Rose didn’t have to worry about being bombed like Maddie has dealt with in the UK. Rose is courted by Maddie and Jamie’s friend, Nick. Before he’s transferred to the front, he proposes and Rose thinks he’s joking. She remarks that she doesn’t understand why so many people rush into marriage during war. This comment struck a chord with me. As I’ve said before, my hubby and I got married 72 hours before he had to report back for duty before he flew out for Iraq. We had had the marriage before battle talk several times before we got married. Unlike Rose and Nick, , we’d known each other and dated for almost a year and a half. It wasn’t a rushed thing like Rose believed hers would be. In a way, she comes to regret her decision. During a mission, she’s intercepted by two Nazi war planes which force her to follow them to Germany. They are surprised to see that she is a female pilot, but still turn her over to authorities. She is sent to Ravensbruck, the same camp Julie was sentenced to go to. Once at Ravensbruck, we meet several other incredible women. First, we meet Elodie who was part of the French Resistance. After this brief encounter, she and Rose never encounter each other face to face again, but Elodie still plays a major role as a supplier. She later meets the Rabbits and a few other political prisoners. The tales of what these women endure is very difficult to stomach. 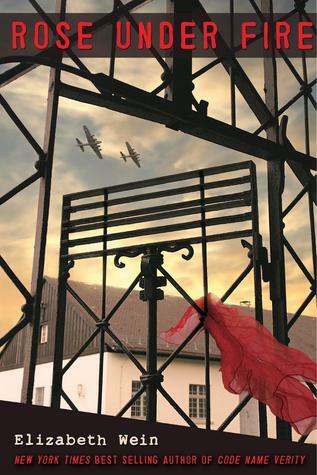 Even though this is a historical fiction novel, it is based on true evens that did occur at the prison camp. It is incredibly relieving to know Rose survives Ravensbruck. I don’t think I’m spoiling this the way the book is laid out and if you look at the chapter lists. Still, reading the things that happens in Rose’s six month tenure is heartbreaking. All of this happens after D-Day, which was the turning point in the war, but not the end by any means. The time frame Rose recounts her time in Ravensbruck is the same time the 89th Infantry Division liberated Ohrdruf Concentration Camp. Reading Rose’s story and having researched the things my Grandaddy saw had me in tears off and on the entire latter part of the book. My Grandaddy could never speak of the horrors he saw. Roza, one of the Rabbits, was operated on five times at Ravensbruck and was almost permanently crippled. The doctors did horrific experiments to “simulate” situations at the front. In reality, it was for the sheer pleasure of torture. Karolina only endured one operation but spent eight months terribly ill and close to death before she finally recovered. She escaped with only a minor limp. Lisette was a political prisoner from Poland, but she was originally from France. She was the adopted mother of the group. I absolutely adored Lisette. She reminds me of my Gran with her love of learning and being incredibly loving and caring. Irina was a Soviet combat pilot who had been shot down and captured. I also admired Irina. Though she was staunchly against the Fascists, she also wasn’t thrilled with the Soviets. The story comes to a close during the Nuremberg trials. In a way, the conviction of the captured Nazis doesn’t seem like enough justice for the terrible things they did. There never could be large enough Earthly cost for them to pay for their crimes. I really liked that most of the book was written as a journal recounting. I have never been through anything traumatic and I’ve often kept a journal because like Rose, I find writing therapeutic. I did enjoy her poetry. I would like to know more about what happened to Rose down the road. Did she become a doctor? Did she get married, etc.? Minus that disappointment, I highly recommend Rose Under Fire. A difficult topic to stomach, but a lesson to be remembered so as to not be repeated. Elizabeth Wein has lived in Scotland for over ten years and wrote nearly all her novels there. Her first five books for young adults are set in Arthurian Britain and sixth century Ethiopia. The most recent of these form the sequence The Mark of Solomon, published in two parts as The Lion Hunter (2007) and The Empty Kingdom (2008). The Lion Hunter was short-listed for the Andre Norton Award for Best Young Adult Fantasy and Science Fiction in 2008. Elizabeth also writes short stories. Elizabeth’s latest novel for teens is a departure in a totally new direction. Code Name Verity, published by Egmont UK, Disney-Hyperion and Doubleday Canada in 2012, is a World War II thriller in which two young girls, one a Resistance spy and the other a transport pilot, become unlikely best friends. Code Name Verity has received widespread critical acclaim. Among its many laurels it is shortlisted for the CILIP Carnegie Medal; it is a Michael Printz Award Honor Book, a Boston Globe/Horn Book Awards Honor Book, and an SCBWI Golden Kite Honor Book. It is also a New York Times Bestseller in young adult fiction. The next book in my World War II binge is back in the Allied perspective. In a way, it was comforting to return to it. Code Name Verity is the harrowing tale of British (not English, mind you) best friends, Julie and Maddie. One is a pilot, the other is a spy and this two part book covers the beginning of their friendship through an operation in France in 1943. Remember, this is classified. Careless talk costs lives. (World War II OPSEC – operation security – for Britain) This MilSo LOVED that reference throughout. I think I’ll encourage anyone who asks details about hubby’s future deployments to look up World War II propaganda. The first narrator of Code Name Verity refers to herself as ‘Queenie’ through her tale. She has been captured by the Gestapo in France. She agrees to tell them information about the British airfields in exchange of ending torture. In the way she gives the information is through the story of how she and Maddie became best friends. You can tell through her mannerisms and speech that ‘Queenie’ comes from a privileged background. At times she seems flippant, which may be how she protects and isolates herself from her situation, but it was a bit grating. Not enough to deter me from finishing. I was far to interested to see the outcome to let a bit of snarkiness get me down! I can be quite snarky myself. Queenie’s tale is also very heavy with technical details. It can be a bit overwhelming, but you have to remember she is doing her job. She agreed to give details on Britain’s air front war movements and that’s what she does. There are some very tedious parts through her tale as well as some heartbreaking ones. She has little interaction with the other prisoners, but what she does is hard to stomach. She has to witness torture and an execution. She also has to deal with them hurling insults at her because she has agreed to work with and help the Germans in order to save her own skin – if only temporarily. Spies don’t survive capture and she understands that. She doesn’t sit and dwell on rescue. She remains realistic and determined to carryout her mission. The second half is narrated by ATA pilot, Maddie Brodatt. You already feel a connection with Maddie because you watched how her friendship with Julie unfolded in the first half. Maddie survives the crash in France, but is in more danger than ever because she is a Jew. Obviously, German occupied France is not the best place to be a Jew. From Maddie, we get some missing pieces of time that Julie didn’t know what happened. She visits Julie’s home and sparks start smouldering between Maddie and Jamie, Julie’s beloved brother who survived an aeroplane crash in the North Sea. I enjoyed Maddie’s part a lot more than I enjoyed Julie’s. Despite Julie’s situation which should’ve been rife with emotion, it keeps you a bit at arm’s length. It wasn’t a bad thing by any means. I’m a very emotional reader, so I connected to the emotion driven Maddie more than I did with the cool and calculating, Julie. I loved both characters dearly, I just happened to connect with Maddie more. Another great week of blogging work and reading. I am well ahead on my schedule and that makes life much easier with two kiddos. Especially now that it is spring time and warming up. We plan on playing outside as much as possible after being cooped up all winter! I’ve already been enjoying some time in the sun while they nap. Curled up in the hammock reading. It’s great! The Path to Allegiant by Veronica Roth. 1 star. Prisoner of Night and Fog by Anne Blankman. 4 stars. 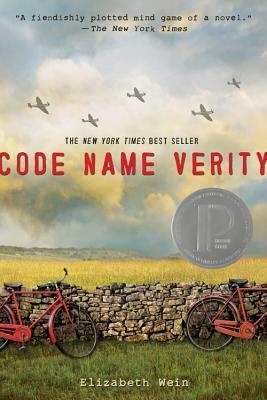 Code Name Verity by Elizabeth Wein. 4 ½ stars. Penguins Can’t Fly by Richard Byrne.